This app can be used with a wide variety of age groups ranging from preschoolers to teenagers. The user interface is simple enough for ages 3+ to use without any additional instruction. The use of the app doesn’t require reading, so it’s an ideal tool for using in a preschool story circle (see lesson plans) as well as a general writing prompt for all ages without reading or native language barriers. This app is available on the iTunes Store for iPhone, iPad and iPod Touch. It is also available for Android phones and tablets – including the Kindle Fire and NOOK – in the Google Play Amazon market, the Amazon Appstore for Android, the NOOK store, and on BlackBerry 10 on BlackBerry World. Universal App for iPhone, iPad and iPod Touch with Retina support. Android app for phones and tablets include the Kindle Fire. Choose number of dice to roll, 1-10. Charades – Use the single die roll to determine a charade item. Stories With Friends – Form a circle. Roll the Story Dice (any number, 1-10). Create a sentence including all of the items from the dice. Pass to the next person and repeat, adding onto the story each time. Song Challenge – Roll a single story die. Come up with a song that includes that item in the lyrics. Poems With Friends – Same as Stories With Friends above, using only 1-2 dice, and create rhyming lines. Drama Club – Roll dice (any number). Form a character using these items, then create an improv skit with friends as your characters! Story Dice is primarily useful in higher order activities under Bloom’s Taxonomy, particularly Synthesis, where you create, invent, compose, predict, plan, construct, design, imagine, propose, devise, and/or formulate. You can devise less and more challenging activities, as in the following example. Student/Short Version: Student will create a character using Story Dice, then describe/write/dramatize their own “perfect day” from their character’s perspective. Teacher Version: Student will create a unique character using the Story Dice for seed ideas. After writing a short character sketch, student will compose a Journal Entry called “My Perfect Day” writing from their new character’s perspective. The Creating step is the highest order activity and is a self-grading option.. Finally, a fun bonus option in a classroom or small workgroup setting is to have students perform their journal entries as monologues, in character, possibly interacting with each other, adding a drama element. Remembering: Roll five or more Story Dice. Identify and describe the pictures on dice. Understanding: Paraphrase the task (Journal Activity “My Perfect Day”) in which you will use the dice. Applying: Prepare a chart with five categories: name, age, job, pets, hobbies. Place each dice image within a category. Imagine that you are this character and write a short paragraph describing yourself in detail. Analyzing: Examine each feature of your character and determine what makes them special. Evaluating: Decide what worked and what didn’t in your journal entry. Were you successful at combining the dice pictures in a believable way? Creating: Compose a journal entry called “My Perfect Day” from the character’s perspective. BONUS Activities: Perform journal entry as a monologue and interact with other students. Stay in character! Story Dice for Apple iPhone, iPad, and iPod Touch – available from the App Store. Story Dice for Kindle Fire and other Android devices – available on the Amazon Appstore for Android. 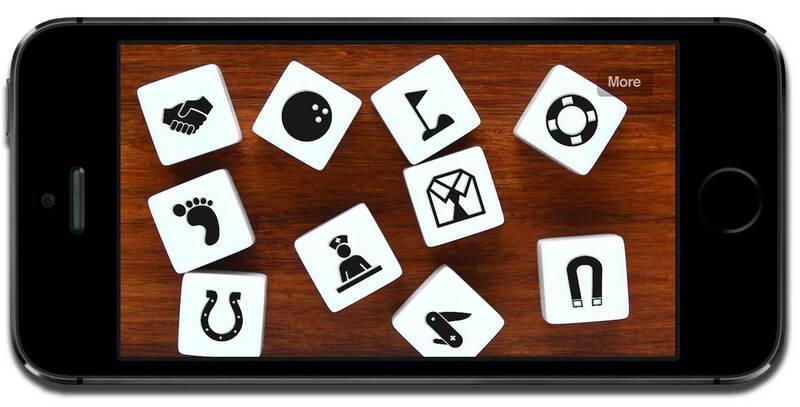 Story Dice for Android devices – available from Google Play. Story Dice for NOOK – available from the NOOK Store. Story Dice for BlackBerry Z10, Q10, and PlayBook – available from BlackBerry World.